BANGKOK, 9th February 2018 (NNT) – The Prime Minister, Gen. Prayut Chan-o-cha, has urged government agencies to operate with transparency, in a move to raise people's confidence and positive perception of the state sector. Gen. Prayut presided over a ceremony to present awards to government agencies with excellent financial practices. In this event, a total of 22 agencies received 24 awards. The Prime Minister congratulated the winners and called on all government agencies to be prepared and and adapt to social changes. He said the agencies have to respect the law and move together with a proper checks-and-balances mechanism. 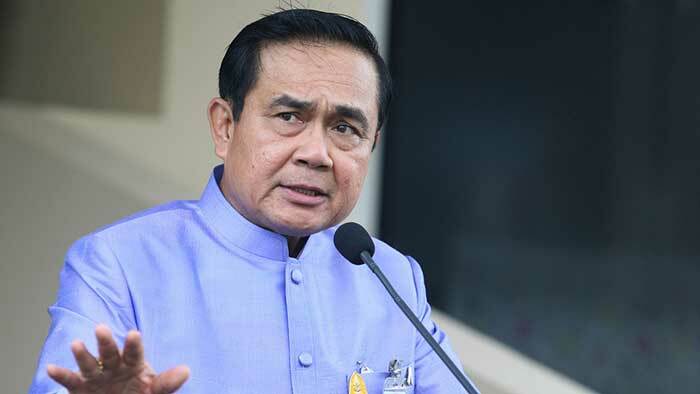 Regarding the Thai Niyom (Thai-ism) campaign, the Prime Minister said the projects in this campaign should focus on providing training courses and capability enhancement to low-income earners, which would require teams of government officials to learn more about villagers in areas across the country. He said the projects would then drive forward local development, answering the needs of the local people. to learn more about villagers in areas across the country. thais do not know thais ? the current bunch's friends, neighbors,relatives , this generation and the previous 2, originate non-urban; and the current bunch does not know ? Which would require teams of government officials to stand over and spy on people in the poor villages, to make sure they cooperate with the new "thai ism" indoctrination. The PM gives himself yet another media opportunity and makes a big thing of 22 agencies receiving awards for excellent financial practices. Does that imply the other 100,000+ government agencies (excluding local government agencies) were not worthy of such an award? I suspect that the word "transparent" has a different meaning in Thai? Or that "transparency" is measured on an escalating scale: more transparency for red-shirts, less for others? Just as transparant as you were when people asked where your huge capital came from? Or as transparant as your DPM was when asked about where his watch collection came from? True - transparency either applies to all or none. But as usual here, it's always do as we say, following our rules, which of course don't apply to us! Conundrum how to get to frosty opaque with blinkers from total blackout with the current shining examples would be the place to start.
. . . transparently . . . is that clear? Just how this guy keeps a straight face is worthy of an Academy award. I wish he'd be 100% transparent on the subject of how much pre-planning went into the Coup. We all know he denied there was any planning . . . how transparently honest was he then, I wonder. Blah, blah, blah - lie after lie, nonsense after nonsense, intelligence-insult after intelligence-insult, idiocy after idiocy, Cretin of Cretins - on and on it goes. As the English would say: 'Give it a break, mate! No one believes a bloody word or even syllable you say' (except one or two on Thaivisa Forum!). Yes, turning back time, is going to take some time. just what is the definition of transparency? and why is it only worth urging on his agencies? This is Thai- transparency: see, what we want you to see!